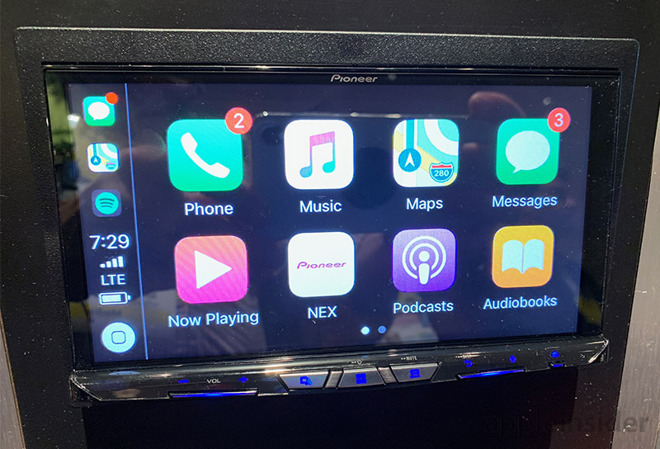 Audio hardware manufacturer Pioneer was at CES 2019 in full force this week to show off its latest wares, including the new AVIC-W8500NEX in-dash receiver with wireless CarPlay support. Coming in at a hefty $1,200, the double-DIN unit boasts an impressive 7-inch high-definition touchscreen display with thin surrounding bezels, similar to other flagship Pioneer receivers. Below the massive screen are buttons for volume, playback, navigation, system controls, CD/DVD eject function and more. This year's NEX is Pioneer's second head unit to support wireless CarPlay, which allows users to tether their iPhone without a physical cable. While the technology is convenient and provides a seamless user experience, aftermarket audio specialists have been slow to adopt wireless CarPlay. Aside from CarPlay, Pioneer's own interface handles a usual assortment of inputs including HDMI, Bluetooth connectivity, support for a back-up camera and more. Like other NEX models, the W8500 also supports SD card playback. A built-in amplifier offers a maximum of 16W by four channels, with a nominal output of 50W for four channels. The AVIC-W8500NEX is shipping out now for $1,200. 2 cents: that aggressive looking button UI doesn’t do it for me. While the technology is convenient and provides a seamless user experience, aftermarket audio specialists have been slow to adopt wireless CarPlay. it certainly is disappointing. But the same can be said for capacitive displays, decent resolution and up to date bluetooth stacks. There is also the tendency to only include wireless CarPlay in the flagship models with expensive navigation and dvd drives as well. You would think they would be rolling out the technology as fast as they can access as many segments of the market as possible, because newer cars do not have standard double din head units and the future aftermarket head unit market will be dead. the market for these guys will be ever grow smaller as cars with double din slots for head unit in the dash become fewer and fewer on the road. Actually, Pioneer released quite a few models with wireless CarPlay last year. seven or eight as I recall. The 8400NEX is just last year's version of the 8500NEX. From your statement I will guess that you have not used CarPlay. Having had a Pioneer unit in my previous truck and using it in my current F150, the big buttons are much easier to use while driving. The combination of the distance to the dash and rough road makes big targets easier to use. It's not the size of the buttons that bother me, it's how unfriendly they look. Sharp edges and angles just don't do it for me. Sorry I thought the reference was to the buttons on screen. The buttons on the unit never bothered me as I do not use them. I only use CarPlay with volume control from steering wheel switch. Just about everything else is handled by Siri. Instead of bit criticism, I would say more power to whoever or whichever car manufacturers offer "the Wireless CarPlay". Consumers are not well informed how important(safety, security,convenience) such phone connectivity to Car's infotainment is so they are not putting pressure on car manufacturers to offer such advancement in car. I am delaying buying my next car until embedded and seamlessly working with my iPhone. Pioneer, as expensive as ever. I got a JVC Navigation unit a number of years ago because I could pop out the whole front face of the unit. Pioneers you can't. I can say, after al these years, I've not once used a DVD in it. Only a few times early on with a CD. It has a SD card slot in the back of the removable head unit. I just throw on a bunch of my music on that to play when I'm in a cell dead zone. The rest of the time I'm streaming. Being able to play a CD/DVD these days seems pointless. Really, does anyone here still do that? The Maps in my unit haven't been updated in years. I normally don't use it for that. I just use my phone. I almost want to swap it out for a unit that does CarPlay, but I'm sure not going to spend this much money on a new unit. This is also a shrinking market as more and more cars and trucks will have a radio you can't just swap out. There's still a lot of older cars out there like my 2003 Silverado. It only has a little over 91,000 miles on it. Ya, I don't rack up that many miles per year. I had Pioneer's top of the line model from last year put in last October and absolutely love it. Being able to leave my iPhone in my pocket when I get in and out and the Car Play all just work wirelessly is ... well, how it should be. I cannot imagine having to be tethered now. Yes, it was a tad expensive, including fitting it cost $1,500, I don't see why they have to cost that much. The interface is very simple and the very responsive touch screen is a joy to use. It responds to touches and swipes flawlessly. My only gripe is I had to ditch my polarized sunglasses as the screen simply goes black. The audio quality is amazing on my Jeep's Harman Kardon speaker system. I thought it was good before, it is tons better now. I would have been interested in the newly released Sony system had I not bought the Pioneer, I've yet to read up on that. Pioneer, as expensive as ever. I got a JVC Navigation unit a number of years ago because I could pop out the whole front face of the unit. Pioneers you can't. I am not sure if the model in this article has the detachable faceplate, but the Pioneer AVH-W4400NEX does. Other than that, the only differences I see in the two units is the 8400 has a capacitive screen and built-in navigation. To me, the nav is a feature I think most can do without since I am sure most people are seeking these out for CarPlay and Android Auto, which have their own navigation apps. With a $500 price difference, I am going for the 4400.